This is the first article in the series where we will be comparing Articulate Storyline 360 and Adobe Captivate 2019. 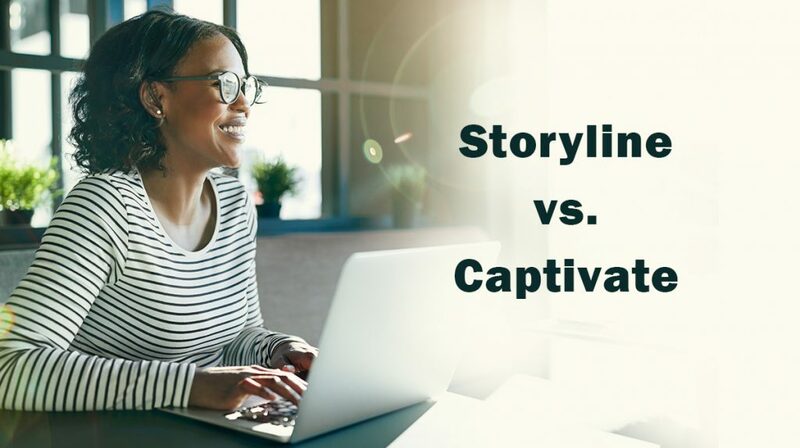 We have been asked the question “Storyline vs. Captivate: which one should I go with?” many times, so we decided to do a thorough review of both tools to help our readers select the eLearning authoring tool that is right for them. The truth is, each tool has unique advantages as well as unique drawbacks, and no solution works best for all eLearning developers. We hope that these articles will provide a clear overview of strengths and weaknesses of both tools, and will enable the readers to make an informed decision when selecting an eLearning authoring software. We will start by reviewing the types of content supported by these tools. Virtual reality projects Virtual reality is not currently supported in Articulate Storyline. Adobe Captivate 2019 allows to create basic virtual reality eLearning projects. Cluelabs eLearning widgets All Cluelabs elearning widgets work with Storyline 360, backward compatibility with Storyline 2 is also in place. All Cluelabs widgets work in Captivate equally well as they do in Storyline. Responsive content While the player itself is responsive and adjusts based on the screen size, the eLearning content itself always looks the same no matter the device. Responsive eLearning projects are supported and work well with different types of devices, content can adjust based on the screen size. Software simulation Storyline provides a set of tools to record, edit, and display software simulations. Software simulations are supported in Captivate equally well. PowerPoint import Users have the ability to import slides from a PowerPoint presentation. Prior to importing, Storyline will display a two-dimensional grid showing all slides in the presentation to help the user select only those slides that are needed. Slide content is converted into Storyline objects (text boxes, shapes, etc. ), becomes part of the slide, and can be moved around and edited in Storyline. While PowerPoint slides can be imported into a Captivate project, it’s worth noting that slides are imported as single objects. This means that content cannot be edited directly in Captivate, any edits have to go through PowerPoint, which adds extra steps to the process and makes the overall development less convenient. In addition, you cannot interact with PowerPoint objects through Advanced Actions in Captivate. Adobe Photoshop import There are currently no options to import assets directly from Adobe Photoshop. The assets can be imported from Photoshop. Upon import, they are laid out on the screen as they were positioned in the Photoshop file, saving time on content positioning and alignment. Furthermore, the edits you make later in Photoshop can be propagated directly to Captivate, saving you time and effort. Will I need to import PowerPoint content into my eLearning course? Do I plan to create virtual reality-based training programs, are my learners and organization ready for this type of content? If I need the virtual reality compatibility, will I be satisfied with a limited set of VR features? Will my learners access eLearning from mobile devices as well as desktops? If I expect the learners to use mobile devices for learning, will they do this often enough to justify the longer time needed to create responsive learning projects? Will I design slides in Photoshop prior to creating the learning course? If so, how important is it to be able to import designs directly into the authoring tools?